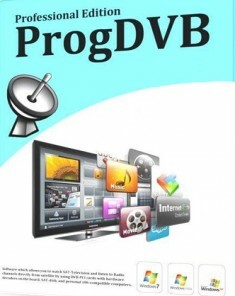 ProgDVB – the universal and very power software for watching digital TV and listening to radio channels! ProgDVB allows you to watch SAT-Television and listen to Radio channels directly from satellite by using DVB-PCI cards with hardware decoders on the board, SAT-dish, and personal computers with Microsoft Windows installed. It has options for working with network broadcasting and Audio/Video recording of the stream to different digital-media formats. ProgDVB support the various types of data sources: Internet TV and Radio. About 4000 channels in the list; DVB-S (satellite), DVB-S2, DVB-C (cable), DVB-T, ATSC, ISDB-T, IPTV. Analog TV or playback from a file. Requires Microsoft .NET Framework installed.